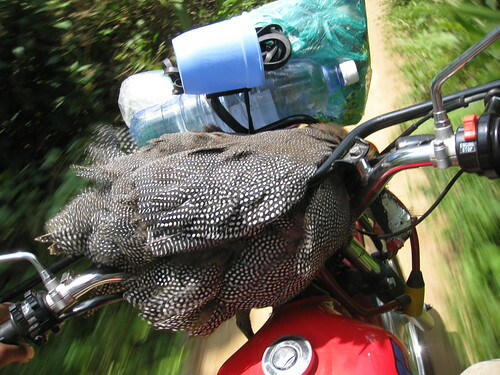 Barely 20 km outside of Kindu, my motorbike hit a domestic guinea fowl or “kanga”. Village animals are rarely penned. Though we braked so hard we nearly toppled, we could not avoid the “kanga”. It died instantly. Guinea fowl on the handlebars. Alas. We left the owner with 10 dollars, twice what he would have had if he sold it in the market. The sun was hot and we soon worried that the “kanga” would rot on the handlebars if we did not gut it. 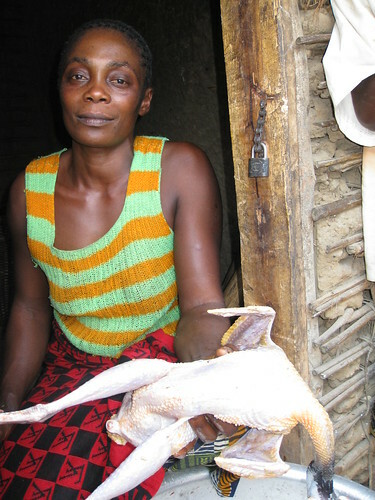 We stopped in the village of ChumbeChumbe and asked a friendly resident, Maria, to skin and clean it. Maria about to cut up the Kanga while clouds gather overhead. That is where the first rain caught us. While Maria cut up the fowl , deep fried it in palm oil and wrapped it in “ngongo” leaves, we clustered under the baraza roof with half the population of Chumbechumbe. 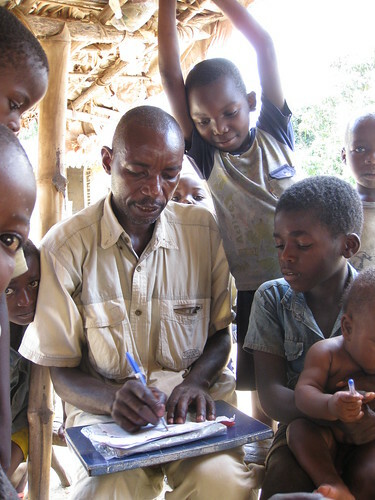 The local nurse took advantage of the first sun-showers to teach math to the kids crowded under the roof. Some of the kids, of course, just played in the rain. We continued at the first break in the rain, but night caught us long before the Lomami crossing. We were exhausted and eventually just stopped at a small village. The roar of our motorbikes brought the already slumbering population stumbling out. With true African hospitality they freed two sleeping benches, one for John and me and another for my driver, Papa Bolenga (nope, I did not even think of trying that road by myself). And then they also brought us plates so we could eat our “kanga” and bread. 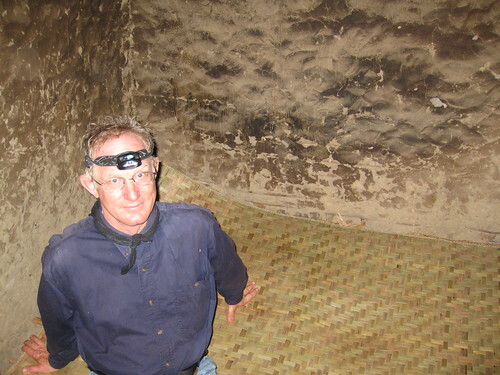 John on our bed in the village of Lukunda where night caught us. The little bit of guinea fowl that was left we finished the next day on the other side of the Lomami River with the village chief at Kahodi. 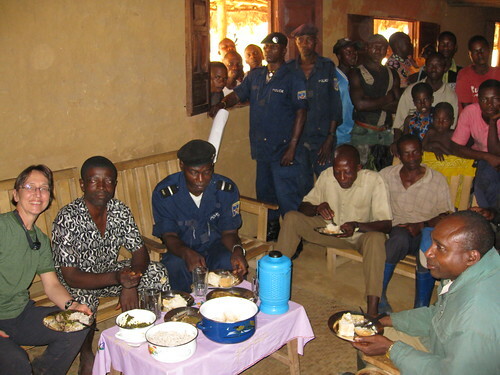 In fact, as most the male population at Kahodi showed up to greet us, we brought out the sardines too. The chief supplied pounded manioc leaves cooked in abundant palm oil and freshly harvested and cooked rice (much superior to stale Kindu bread). Snapshot of the feast with the last of the guinea fowl and sardines as well! It was a gastronomically superb trip. Will Village Murder bring Village Rebirth? This entry was written by Terese Hart, posted on 2008-11-08 at 12:00 pm, filed under About the project. Bookmark the permalink. Follow any comments here with the RSS feed for this post. Post a comment or leave a trackback: Trackback URL. 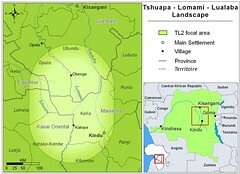 And that new president is being cheered incredibly in Kindu, in Kisangani, in Kinshasa and — I’ll bet you — even in Goma. Great post and great pictures. How did the kanga taste?